Prepare Basic Pizza Dough as directed below. Place loaded Pizzazz® baking pan on Pizzazz® pizza oven and bake on DUAL setting for 6 minutes. Remove baking pan. Heat apricot jam to soften slightly; mix with cream cheese. Evenly spread cream cheese on crust. Sprinkle 1/4 cup crushed gingersnaps over cream cheese mixture. Arrange nectarine slices, overlapping slightly, concentrically around outside edge of pizza. Repeat an inner circle with plums. Fill center with blueberries. Combine melted butter and cinnamon. Brush on fruit. Brush edge of crust with apricot jam. Mix remaining 1/4 cup crushed gingersnaps with brown sugar. Sprinkle over fruit. 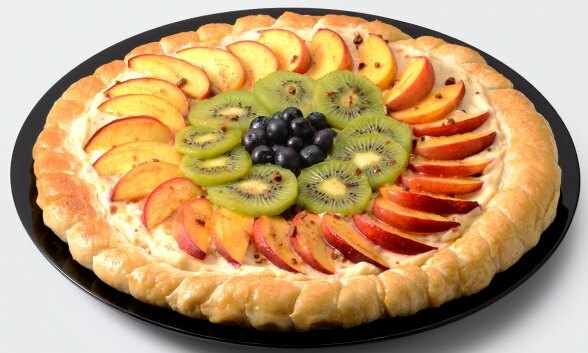 Place loaded Pizzazz® baking pan on Pizzazz® pizza oven and bake on DUAL setting for 15 minutes, until fruit is warm and sugar is melted. If seasonal fruit is not available, substitute fresh ripe pears, kiwi, apricots, and frozen (thawed and drained) blueberries.